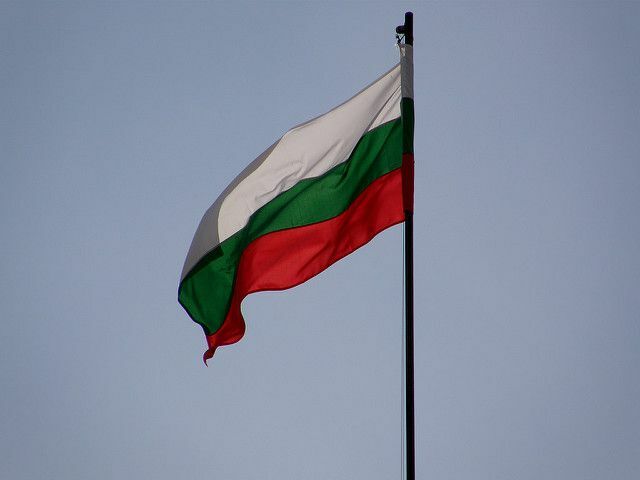 The national flag of Bulgaria consists of three horizontal stripes: white, green, and red. White symbolizes peace, green symbolizes the emergence of Bulgaria as an agricultural nation, and red symbolizes bravery. Bulgarian folk costumes consist of pants, shirts, and vests for men and dresses and aprons for women. The aprons, dresses, and shirts are usually embroidered in regional colors and folk motifs. Red features heavily in Bulgarian folk dress, but black, green, and white are also a part of traditional clothing from Bulgaria's various regions. The day of Baba Marta (Grandmother March) falls on the first of the month. On or before Baba Marta, Bulgarian people give each other martenitsa, or martenka, which are red and white tassels sold by vendors in shops and on the street or may be hand made. The colors of the martenitsa, whose symbolism comes from an old Bulgarian tale, represent blood and snow. Bulgarians are supposed to attach the ​martenitsa to their persons or clothing. Traditionally, the martenitsa were not removed until the first stork returned from migration to ensure prosperity and good health, but today this rule is bent or ignored with respect to modern times. Easter in Bulgaria is a strongly celebrated holiday. Red, the predominant color of Bulgarian Easter eggs, is a part of pagan mysticism that pervades Bulgarian culture even today. Red Easter eggs are baked into an Easter loaf, may be blessed at the church, or may be cracked against each other to see who will be the most successful, healthy, or happy during the following year. These Easter eggs have been decorated with Orthodox designs and symbols and differ from Polish Easter eggs. Christmas Eve in Bulgaria is celebrated with traditional foods after the Advent fast. Walnuts are a necessary component to the Bulgarian Christmas meal. Each member of the family cracks one in order to determine their fate for the next year. If the walnut is a good one, it is said that the year will be successful. Bad luck is predicted for the person who cracks a bad walnut. Troyan pottery, traditional Bulgarian pottery, is a great souvenir. This pottery originated in the town of Troyan, where the clay was especially good for making useful vessels in warm earth tones. Available for purchase in Bulgaria are Troyan plates, cups, bowls, vases, and even tea sets. While shopping for souvenirs in Bulgaria, you're sure to run across lots of fine examples of Bulgarian folk art. Dolls wearing traditional Bulgarian costumes - either fashioned from cloth or carved from wood and painted - make wonderful additions to your personal Eastern European souvenir collection. The Greeks will tell you that only Greek-made feta cheese should be called feta. But Bulgarians make and eat feta cheese too. They call this "white cheese" sirene. Bulgarian feta, made from sheep or goat milk, is eaten all over Bulgaria in traditional Bulgarian dishes, like the shopska salata, consisting of sirene, tomatoes, onions, peppers, and cucumbers. This Bulgarian feta cheese is displayed on a plate of Bulgarian pottery. Bulgaria has many examples of Byzantine churches that attest to Bulgaria's long relationship with Eastern Orthodoxy. While Bulgaria has spiritual influences from Islam, other religions, and ancient pagan mysticism, many Bulgarians are deeply devout followers of the Orthodox faith. Rila Monastery is a part of the Bulgarian Orthodox Church. Thracian artifacts and ruins can be viewed all over Bulgaria. This means that Bulgaria has lots of museums dedicated to its Thracian history as well as many archeological and protected sites. In fact, some Bulgarian cities were ancient Thracian cities, like Plovdiv.